Service-oriented computing (SOC) receives a lot of attention from academia and industry as a means to develop flexible and dynamic software solutions. Facing the facts, service-oriented solutions are by far not as dynamic and adaptable as they claim to be. The initial idea of the SOA triangle to publish-find-bind-execute a service is often not implemented as envisioned due to a number of missing or wrongly-used concepts. For instance, service registries (such as UDDI and ebXML) are often missing. The VRESCo runtime environment aims at addressing some of the current challenges in Service-oriented Computing research and practice. Among others, this includes topics related to service discovery and metadata, dynamic binding and invocation, service versioning, service notifications and QoS-aware service composition. Besides this, another goal is to facilitate engineering of service-oriented applications by reconciling some of these topics and abstracting from protocol-related issues. 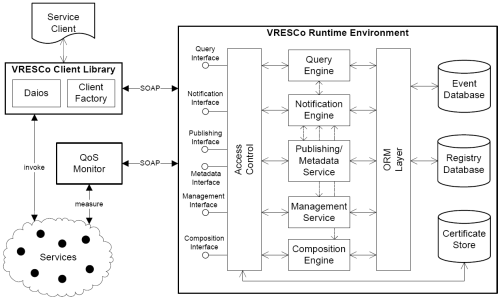 The basic architecture of VRESCo is shown in the following Figure. To be interoperable and platform-independent, the VRESCo services are provided as Web services which can be accessed either directly using the SOAP protocol, or via the client library that provides a simple API for accessing these services. Services and associated metadata are stored in the registry database that is accessed using the object-relational mapping (ORM) layer. The services are published and found in the registry using the publishing and querying engine, respectively. The VRESCo runtime uses a QoS monitor which continuously monitors the QoS values of services, and keeps the QoS information in the registry up to date. Furthermore, the composition engine aims at providing support for QoS-aware service composition which is part of our ongoing work. The event notification engine is responsible for notifying subscribers when certain events of interest occur. The source code is available under open source license at http://sourceforge.net/projects/vresco/. A brief Installation Guide can be found here. To get started, take a look at the example scenario, which is included in the VRESCo sources and briefly described here. Furthermore, you can look at the experimentation page that we did as part of a recent journal paper. Several papers are available for download. By following these links you agree to respect the copyrights of the papers. The papers obtained from this Web page are included by the contributing authors as a means to ensure timely dissemination of scholarly and technical work on a non-commercial basis. Copyright and all rights therein are maintained by the authors or by other copyright holders, notwithstanding that they have offered their works here electronically. It is understood that all persons copying this information will adhere to the terms and constraints invoked by each author's copyright. These works may not be reposted without the explicit permission of the copyright holder. Philipp Leitner, Anton Michlmayr, Florian Rosenberg, Schahram Dustdar: "Selecting Web Services Based on Past User Experiences", Proceedings of the IEEE Asia-Pacific Services Computing Conference (APSCC'09), Biopolis, Singapore, December 2009. Florian Rosenberg, Christian Platzer, Schahram Dustdar: "Bootstrapping Performance and Dependability Attributes of Web Services". Proceedings of the IEEE International Conference on Web Services (ICWS'06), Chicago, USA, September 2006.